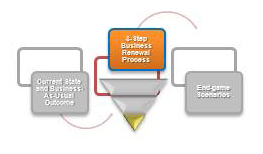 Successfully executing on corporate transformation and renewal requires laser focus on the end state, coupled with bite-sized execution steps that are clear, measurable and tied back to the end state through a hierarchy of detail. This is the integrated 12-month Financial and Operating Plan. 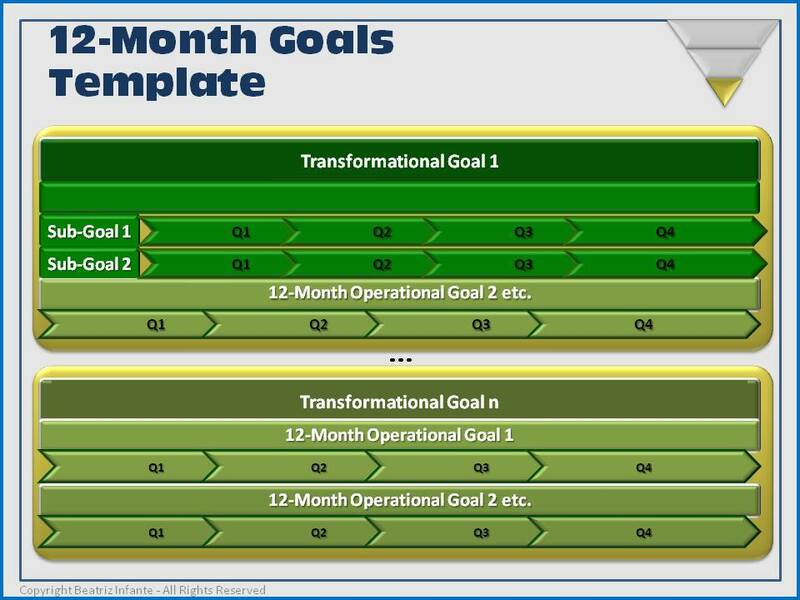 During the process of creating this integrated 12-month financial and operating plan, each Transformational Goal is broken down into one or more 12-Month Goals, each of which has quarterly objectives and both operational and financial metrics associated with quantifiable outcomes. Many companies make the mistake of setting operational objectives without explicitly defining the metrics for success, both from an operational as well as a financial point of view. For example, “improve customer satisfaction” might be a goal. But by how much? And what will that improvement cost? There is no one appropriate answer that applies to every company, but each company must decide what the best blend of operating and financial results are necessary for success in each goal category. The final step is in clearly identifying who is responsible for which actions, specifying who will be accountable, and reflect that in the employee’s personal MBO’s tied to variable compensation. To provide maximum clarity to the organization, reinforce that executives – not just rank-and-file – are ultimately responsible and accountable for meeting these objectives and that accountability is clearly articulated in the integrated financial and operating plan. 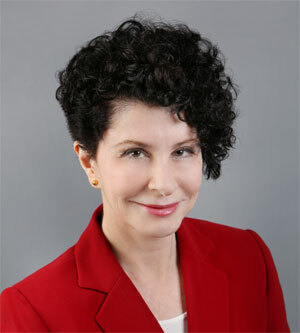 The key takeaway is that, rather than setting MBO’s by functional area and implicitly connecting the success of those goals to the company’s success, there is an explicit connection that flows from the overall Transformational Goal, to the timeline of the Transformational Arc, to organizational and individual goals. This ensures there is 100% correlation between individual success and the company’s success, and that correlation is explicit and visible. Let’s go back to the Transformational Goal Definition Case Study example, which described a company transitioning from tactical equipment manufacturer to strategic supplier. 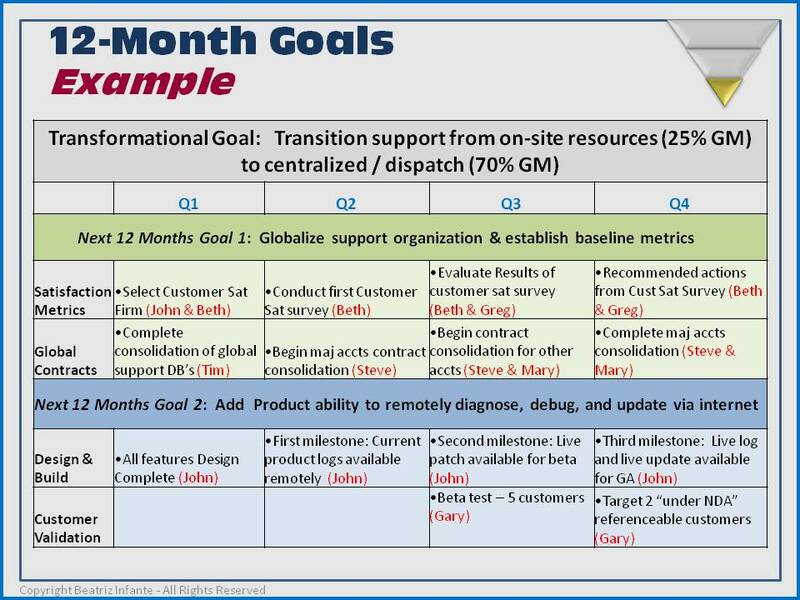 One of the transformational goals involved transitioning the support model from using dedicated on-site resources (which resulted in a 25% GM support business), to a model where customer specialists centralized in a call center are able to handle most support problems, and only dispatch resources to the customer site in unusual circumstances. That change results in a significant increase in the operating results for the support business to 70% GM. It also yields improved customer satisfaction because rather than a single individual residing at the customer site, who may take sick or vacation days and therefore create a service discontinuity, there is a “pod” of dedicated specialists providing 24×7 service dedicated to a small number of customers. So the customers still have personal associations and know the name of their support person, but the support load is distributed among several people. However, in order to make this support model work, the software must be updated so it can be remotely serviced. Without this capability, the software must be locally serviced and a remote support model is infeasible. In addition, there are multiple support databases in different geographies. To provide centralized support, these databases must be integrated. In addition, some of the contracts in different geographies have different T&C’s, so these also must be reconciled. The support organization must be unified on a geographic and operational basis, including consolidation of multiple geographic databases containing product and support contract information. In addition, the multiple customer support contracts, each with slightly different terms and conditions depending on geography, must be reconciled and integrated into single master global contracts with the current installed base of customers. The company should also conduct its first electronic customer satisfaction survey. This concise format captures all the essential concepts in one page which fully defines the cascade of corporate goals, moving from the highest level aspirations to individual quarter-by-quarter goals which tie closely to the company’s financial and operating plan. Thus, the long term transformational goal for the company, the specific things the company must achieve each quarter of the coming year to move towards the long-term goal, and what the individual must specifically accomplish in order to meet the short-term and long-term company goals, are all captured concisely, providing complete clarity to all employees of how their efforts tie into the company’s immediate-term and long-term success. Providing this level of clarity “puts all the wood behind one arrowhead” and creates a self-empowered workforce, all working towards common goals and incented to achieve the company’s success as well as their own. Want to read from the beginning of this series? Click here.